CSFR (Ab-561) antibody detects endogenous levels of total CSFR protein. The antiserum was produced against synthesized peptide derived from Internal of human CSFR. Small volumes of anti-CSFR antibody vial(s) may occasionally become entrapped in the seal of the product vial during shipment and storage. If necessary, briefly centrifuge the vial on a tabletop centrifuge to dislodge any liquid in the container`s cap. Certain products may require to ship with dry ice and additional dry ice fee may apply. 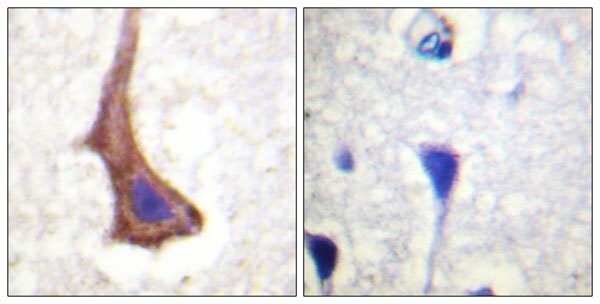 Peptide-+ Immunohistochemistry analysis of paraffin-embedded human brain tissue using CSFR (Ab-561) antibody. 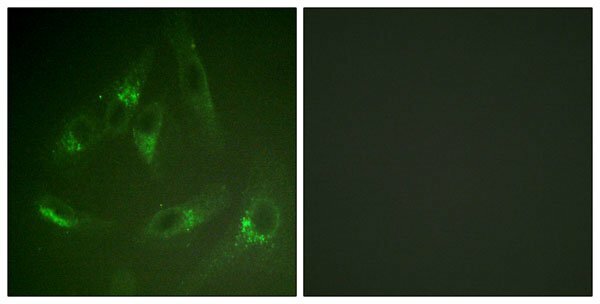 Immunofluorescence analysis of HeLa cells, using CSFR (Ab-561) antibody. NCBI/Uniprot data below describe general gene information for CSFR. It may not necessarily be applicable to this product. Hampe A., Oncogene Res. 4:9-17(1989). Andre C., Genomics 39:216-226(1997). Liu T., J. Proteome Res. 4:2070-2080(2005). 1. Hypoxia promotes glioma-associated macrophage infiltration via periostin and subsequent M2 polarization by upregulating TGF-beta and M-CSFR.